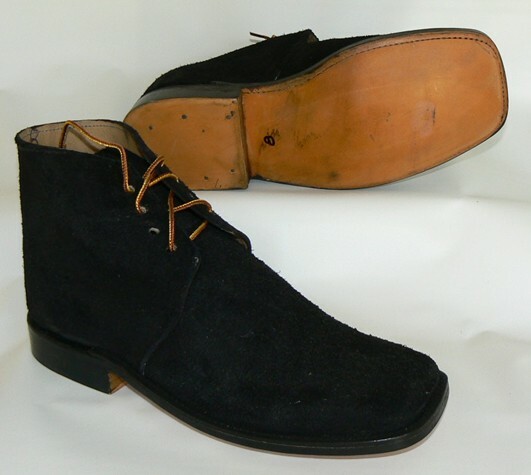 BROGANS, sometimes known as Jefferson's boots, these are ankle high black rough out shoes, sewn soles, worn by both sides during the American civil war. NOTE: before and during the Civil War sewn sole was the norm. Although costing more to make, sewn bootees continued to be made though out the war. Pegged bootees were cheaper to make, but the quality was still there. For example; Schuylkjill Arsenal/Philadelphia Depot issued only sewn shoes, about 3.2 million pairs. New York furnished to the Army through their contractors about 3.8millon sewn and 3.7millon pegged shoes. Bottom line, as you can see by the numbers both sewn and pegged shoes ARE correct for your civil war impression. I am working on getting pegged brogans in the near future.